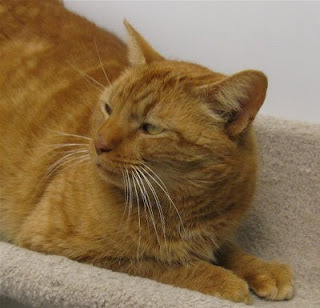 Medfield Animal Shelter News: Leo back home! Leo the orange tabby, this week's pet of the week in the Hometown Weekly, was returned to his family yesterday! His family saw him in the paper and came to see if he was their cat. Thanks to some very distinctive markings on his legs and face, we were able to verify he matched their photos of him. Leo escaped out a window when he was being cared for while his family was away 8 months ago. Hurray for happy endings! What Happens to Imperfect Pets in the Pet Trade?